Note how the SSE underperformed the S&P500 for most of the 2013 – Present period… the ‘shift’ / ‘inversion’ from relative underperformance to extreme outperformance occurred fairly recently. There’s only one person I know who was screaming and yelling (and positioning) Long China, Short USA equities since 2013…let’s call him Donald Duck. I think it’s fair to say he’s the “mr pink” of global macro…it may even be appropriate to call Dan Loeb the “Donald Duck” of event-driven investing. Donald Duck has been pounding the table on going short USD over the last 1-2 quarters. That trade has looked ‘stupid’ until recently. Donald Duck has gotten quite a few other major trades / turning points correct (as well as some very wrong). I don’t fully understand the Duck’s “sausage-making” process, but the result seems to be quite tasty. I told Donald Duck back in 2013/2014 that I felt that the better way to express ‘long China” would be to hand-select a basket of US-listed (and potentially other foreign-listed) Chinese stocks, as the A shares, and mainland stocks would be ‘dead money’. That is, to go about “long China” via an Long/Short China approach, or maybe a long-only approach (but with extremely tight due diligence, careful security selection). Donald Duck, however, expressed his preference for the A shares / indices, (I think) given their lack of focus/expertise on individual company analysis/due diligence. Going long select US-listed Chinese stocks looked smarter in 2013 and through most of 2014 (especially if one avoided the NQ Mobile’s of the world, or even went concurrently short them!) 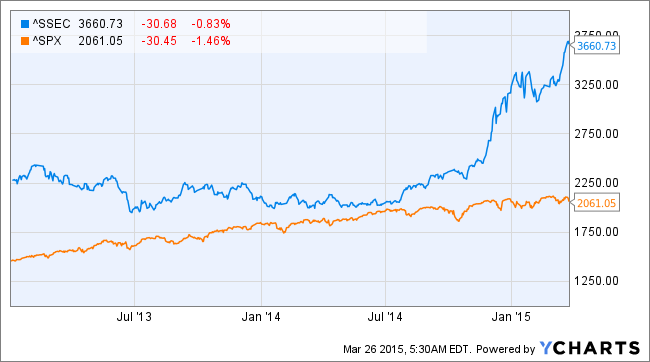 versus going long A shares and/or mainland shares…until recently. What are some fund flow and other considerations between China main-land listed shares, versus China company shares listed elsewhere? If one doesn’t care about global macro, what might the implications be for single-stock picking, sector investing, etc. ?